Aerial view of Lake Powell in Arizona. The prominent white rings surrounding the edges of the cliffs are due to steadily receding water levels. 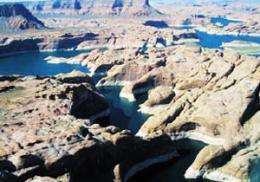 (PhysOrg.com) -- The American Southwest has seen naturally induced dry spells throughout the past, but now human-induced global warming could push the region into a permanent drought in the coming decades, according to Lamont-Doherty scientist Richard Seager and others who have been studying the areas climate. Seager, who focuses on climate variability and climate change, began his work studying droughts by looking into the past using sea surface temperature records gathered by ships plying the oceans in the 19th century. He and colleagues used computer models to recreate a climate history that showed periodic droughts. Focusing on North America, they also used tree rings to look back as far as the Middle Ages, when the Southwest experienced a drought lasting hundreds of years. In a 2007 paper, Seager and colleagues used computer models to show the Southwest is on the verge of a transition to a more arid climate. And in the December 2010 issue of Proceedings of the National Academy of Sciences, Seager and Gabriel Vecchi of NOAA pinned the drying to a drop in winter precipitation and showed how this is caused by changes in atmospheric circulation and water vapor transports induced by warming temperatures. The warming also shortens the snow season, reduces the snow mass that serves as natural storage for water, and forces an earlier spring melt, disrupting the supply system that waters much of the Southwestthe region from the western Great Plains to the Pacific, and the Oregon border to southern Mexico. That is ominous news for a region that has seen explosive growth in population, land use and water demands in recent decades. A reduction in the flow of important water resources such as the Colorado River will have serious consequences. Im curious how the Southwest is going to handle this, Seager says. Too bad this global warming thing is bringing us more moisture than ever. Last winter the mountains in Tucson had over a 10 foot base of snow. Sounds like a drought for sure. You should probably learn what a drought is. Beyond that, the Southwest was a desert before we irrigated it. This appears to be an article about water management, not desertification. This is backwards: ". . . now human-induced global warming could push . . ."
It seems to be more propaganda than science. 1. First establish that human-induced global warming exists. 2. Then speculate on all the possible consequences. Desertification is more a consequence of geology and not of climatology. The SW US is a desert because of the Sierra Nevada range. We're actually getting more snow fall in the last 3 years than we have before. Maybe it's due to the warmer temperatures over the Pacific. Well, the study may have been about water management, but this article is about anthropogenic global warming causing human catastrophy. You are right that there is more than one definition of a drought. Depending on what field you are working in, it could mean decreased precipitation or it could simply mean that people are using too much water, or a combo of both. Unfortunately, most people today have come to think that drought just means no rain, and the way this article is written supports that myth. I actually read a study a couple months ago that was based on defining what a drought is. It cited numerous cases where the different variations of the term are used to abuse the systems for government aid and to avoid water control laws, as well as to make sensational headlines. They said that even amongst leading authorities, there are many different official definitions of "drought". lol, yes. If you use lake level, then Cumberland Lake in Kentucky is in trouble (they drained it about half way down because of questions about the dam's safety). On the good side, if you are right that the Glen Canyon Dam was a bad idea, then there's always the option to drain it and tear the dam down. Dams can be undone and I bet nature would return to that area VERY quickly. All that accumulated sediment would make PRIME growing soil. That would be a really interesting experiment. I wonder what would happen if they drained some of the dams here in South Carolina, and returned them to swampland. They mostly run those power plants on coal anyway. In the interest of proving my point about nature returning when you let water out of a dam, the forst around Cumberland lake has already grown back down to the new water level. It's kinda funny that the forest extended down to the water faster than some of the boat launches did. There's still docks and boat launches that don't reach the water now. I guess people figured that they would fill the lake back up by now. There is no justification for the predictions of drought and desertification. Those are the results of computer models and outright crystal ballery. We have as much reason to believe climate change will result in a greener, more verdant world, with longer growing seasons and more favorable plant conditions. The only reason why the alarmists bang their little bells about the desertification of the world is to create a hysteria. There is nothing these climate scientists can do about climate change; their efforts stem from social ideologies, not science.